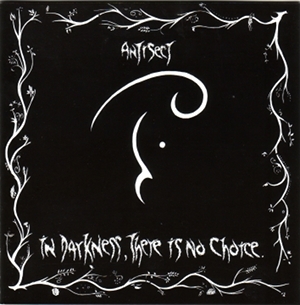 It has recently come to our attention that there is a bootleg of Antisect's In Darkness There Is No Choice recently out on vinyl, apparently on a label called Anti Society. This is being offered as an official release. This is not an official release - neither the band nor Southern are involved. It is particularly upsetting to all of us as we have been working on an official reissue. We have restored the original analogue master tapes and Pete Lyons from the band has worked with Harvey Birrell here at Southern and created new masters for CD and LP. We are reissuing the album on vinyl in the original poster sleeve along with new liner notes and archival photos from the band. We are also completely repackaging the CD, which will include a fold-out miniature version of the LP sleeve as an insert (similar to the way the Crass sleeves are part of the Crassical Collection CDs). The audio for this bootleg will have been taken from a second-hand source, that is to say it's not from the original masters, but is either taken from the 1994 CD or from the 1983 vinyl release. The printing and packaging are also copies and are far inferior to what the band would like to see available. Please do not waste your money on this inferior product. We also urge any retailers or mail orders who are offered this to refuse it and contact us with information.